The costumes are being worn by my 5 year old daughter and 9 year old son. 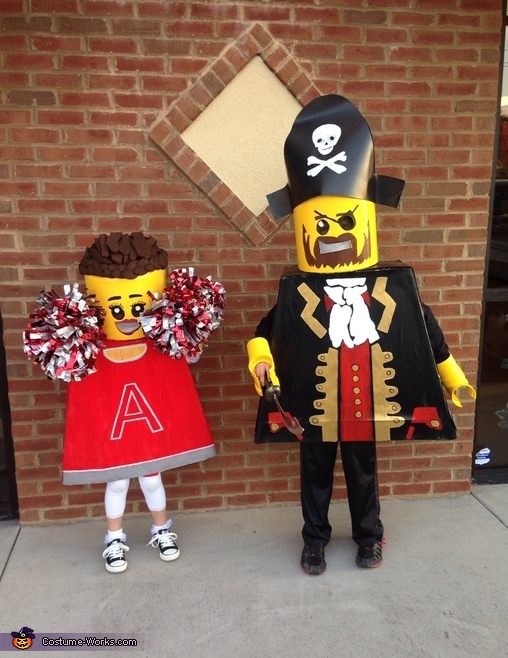 I scoured the internet looking for inspiration in order to make some awesome costumes for my son and daughter who love Legos. After looking around I had stumbled upon your website and we got some great ideas from there. We didn't decide to make these until October 21st and they had to be finished by the 29th for a costume party/contest my kids were going to. The body's are made from cardboard, masking tape, and covered in posterboard. The heads are made from concrete cylinder tubes and styrofoam. We covered the styrofoam in drywall mud to make it smooth. After sanding these were then spray painted. The hands are made from piping my husband glued together and cut to form the shape and then these too were spray painted. The cheerleaders hair was made from foam bought at a craft store then braided or cut and sprayed brown. I attached it using spray glue. The pirates hat was made from posterboard and removable making it easier to transport. We have over 40 hrs in these costumes but they were a huge hit everywhere they went and brought a ton of smiles.